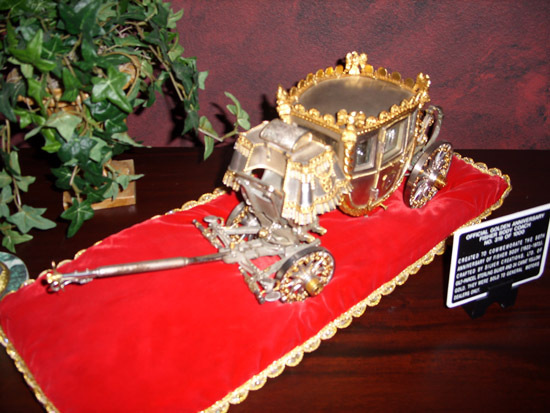 Special permission by Fisher Body was granted to Silver Creations, Ltd. to recreate the Royal Coach and thus mark its Golden Anniversary. With master silversmiths hammering out pieces of the Coach from the original plans, the long past age of coach building returns again. 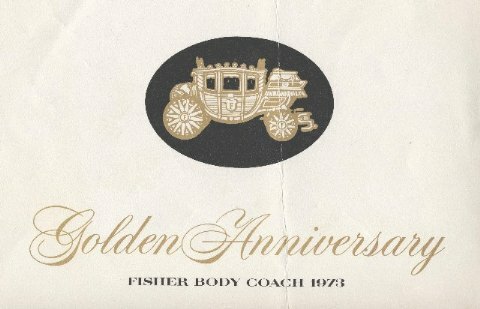 Special permission by Fisher Body was granted to Silver Creations, Ltd. to recreate the Royal Coach and thus mark its Golden Anniversary. With master silversmiths hammering out pieces of the Coach from the original plans, the long past age of coach building returned again. The total number of Royal Coaches was limited to 1,000 units, and they were offered to General Motors Dealers at $2,000 a unit. 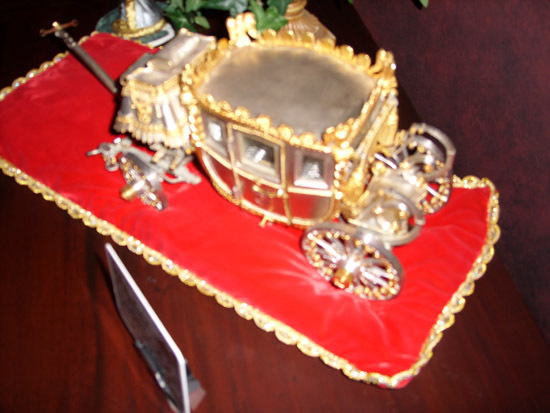 Each anniversary Coach was hallmarked and bears the owner’s personal registration number and certificate of design authenticity. Original plans, authenticated by Fisher Body, were used to capture the most minute details in this handcrafted, commemorative model. Even the stairs fold away and are hidden from view in a special compartment enclosed in the under-carriage. The doors open and close with precision. The headliner has been skillfully carved and textured. Even the tufted seats have been produced in precious metal. The wheels roll and pivot, with the same precision as the full size Coach and bronze fittings are employed to insure strength to the undercarriage. A touch of the body puts springs in motion. From every angle the Fisher Body Coach shows elegance. A platinum coating has been carefully sprayed inside and out to protect its lasting beauty. You would think that by magic the Royal Coach has shrunk to miniature size. To enhance the Golden Anniversary Coach, a suitable display unit is included with a royal velvet pillow. 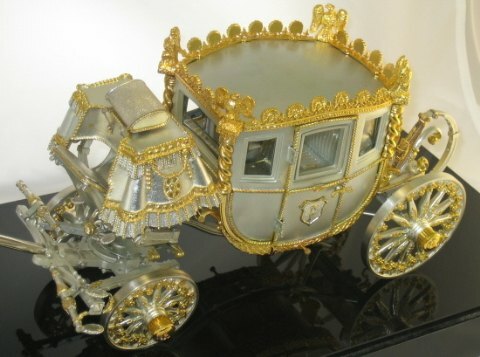 This 1973 Limited Edition Fisher Body Coach was created of sterling silver, gold and platinum by some of the most crafted master silversmiths of Silver Creations, Ltd.
Napoleon not only left his mark on history, but also on millions of cars built in the United States and Canada during the past half century. That mark is the “Body by Fisher” Napoleonic Coach emblem, found attached to the door sills of General Motors cars. Napoleon can claim part of the credit for the trademark because it contains a blend of two most famous coaches owned by the French Emperor. It is believed to have been one of the Fisher Brothers, founders of the automobile body building firm, who first suggested the Coach as the company’s emblem. 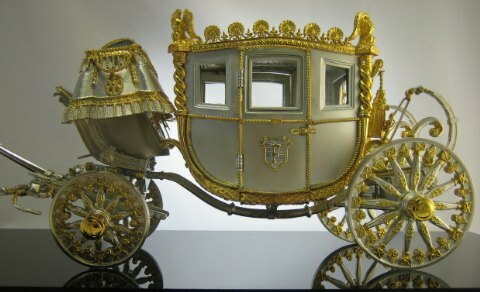 It was undoubtedly considered a very natural choice, because the Royal Coach had, for centuries been a symbol of the ultimate in hand craftsmanship, and the Fisher Family had been carriage builders for several generations. The trademark registration became official on July 10, 1923, and a search to find a craftsman who could construct a scale model of the Royal Coach, led to an employee of the Fisher Body plant in Fleetwood, PA. He was Walter Leuschner, once a Major in the Imperial German Army, and perhaps one of the last Royal Coach builders. Major Leuschner was aided in the Fisher Coach building project by Frank Reiss, an industrial artist from Detroit. Reiss drew up the drafting plans for the Coach, using advice from Major Leuschner. 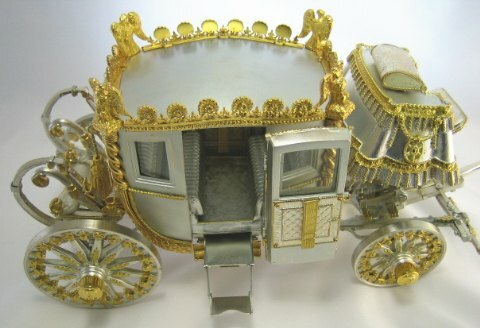 The model was actually a combination of two Coaches, one used at Bonaparte’s coronation, and the other at his marriage to Marie Louise, Archduchess of Austria. The two Coaches were considered among the finest ever produced by the old coach-building Guildsmen. The total number of Royal Coaches was limited to 1,000 units, and were offered to General Motors Dealers at $2,000 per unit. Each anniversary Coach will be hallmarked and will bear the owner’s personal registration number, and certificate of design authenticity. 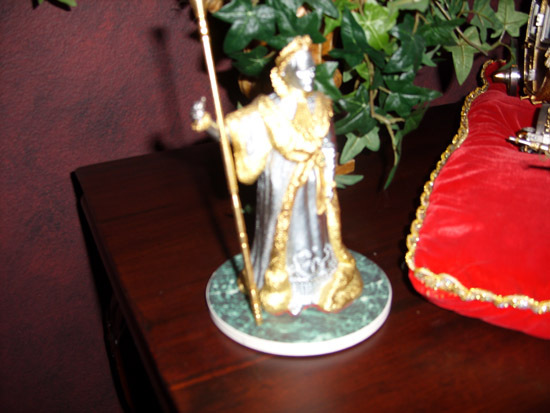 Completely hand-assembled in solid sterling silver and accented by touches of 24 karat gold, this magnificent treasure will surely become an heirloom that will be handed down from generation to generation with pride. Far beyond the value of the precious metal it contains and far beyond the artistry of its flawless execution , the Fisher Body Coach will long endure as a tribute to men of yesterday, whose vision and foresight helped make General Motors the world’s leading automotive producer.